Independence II liveaboard is a part of Bluewater Safaris, a fleet that offers diving safari in Egypt under supervising of an experienced team. Boat was built with divers comfort in mind and he has everything to make your vacation comfortable. 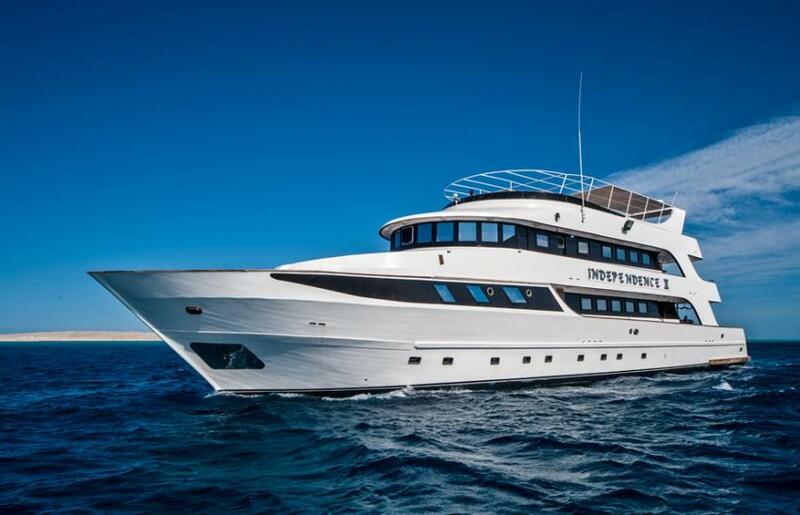 MY Independence II has 10 cabins that can accommodate 20 passengers. All cabins are en-suite and ahs air conditioning. There are 2 double and 2 twin rooms on the lower deck. Deluxe and suites are located on the main deck. And the upper deck has one double suite. Upper cabins are bigger in size and has big windows, so you can observe the view. Boats living room is varied nice and cozy and suites perfect to span time in between dives. It has air conditioning, soft sofas, entertaining facilities. Passengers of Independence II liveaboard can enjoy the sun or relax in cushioned sun loungers on the top deck. There is a shaded area to relax or read a book. Independence II liveaboard dive deck equipped with everything necessary to make preparation for the dive comfortable. There two compressors on board and availability of using Nitrox. Boat has plenty of storage boxes for your gear and a hanging area for wetsuits. Divers can rinse their equipment after using in fresh water tanks. MY Independence II equipped according to all safety requirements. There are life jackets, emergency rafts, fire fighting equipment and fire aid kit. Boats crew trained to manage emergency situations and first aid. Itineraries of Independence II liveaboard include diving on Brother Islands, Daedalus, Elphinstone and southern Fury Shoals and St. Johns. Daedalus is a long reef, made of numerous of colorful corals. There can be rather strong currents that bring lots of fish. Barracudas, snappers and many other can be spotted. Main attraction is a great chance of meeting hammerheads. Elphinstone is a big variety of corals, including brown soft corals, gorgonian fans. This destination is a home for the big amount of tuna, barracudas, angelfish. Reef sharks sometimes can be seen. Brother Islands are famous between divers, This destination can offer not only numerous of colorful coral reefs but also wreck diving. There are two sunken ships that can be explored while diving on Brothers Aida and Numidia. The Southern destination is mostly known for an opportunity of diving with hammerheads. These creatures have been noticed here more times then on the other destinations of Red Sea. The Red Sea is good for diving almost all year round. Middle winter and summer water temperatures can be not as comfortable for diving, but this time still suits for diving. Spring and Autumn months can be considered as a high season for diving in Egypt.